This blog is a companion to my Georgetown Branch page documenting my efforts to research and model the Baltimore & Ohio Railroad’s branchline of the same name. I welcome comments, corrections and submissions here and on the main site. Thanks for visiting! Here I am inspecting one of the bridges at Dalecarlia Reservoir, Jan 12, 2019. Photo by K. Regan. This site is dedicated to all things related to this little 11.5 mile gem of a railroad branchline. Begun in 1892, the B&O laid track from MP 8.3 on the Metropolitan Branch to Chevy Chase, MD originally to serve a coal fired power plant of the Chevy Chase & Kensington Electric Rwy. and some other freight customers. Petitioners in Georgetown eventually won their case and the B&O built on down to the bustling port along the Potomac between 1908-1910. The vision that the line might be a link to the southern railroads never materialized. The plan was to build a bridge across the Potomac near Chain Bridge, but the finances of the B&O would utterly prevent this. 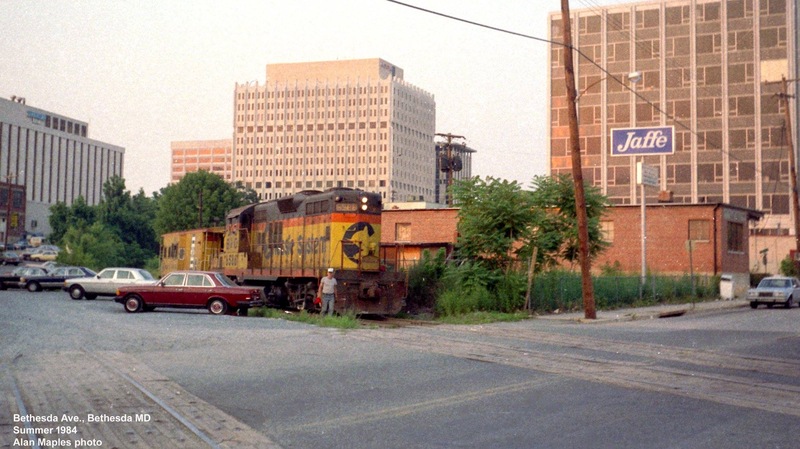 The line saw varying levels of traffic, eventually succumbing to truck traffic, dying businesses along the line, and a suburban housing explosion. In 1985 the line was formally abandoned and in the early 1990’s it was transformed to a rail trail. I have been researching this line ever since I saw it back in the early 1990s when I walked about two miles of the branch and there was still track in place. I decided to make this the subject of my model railroad as well, so I have been gathering photos, documents, maps, books and just about anything related to the line. I have made lots of friends and learned a lot over the years and I welcome additional comments and questions here. Peruse the site and please let me know what you think. If you have any memories of the line, or materials you’re willing to share (I’m always looking for more) please don’t hesitate to contact me. Thanks and enjoy! https://ddotlibrary.omeka.net/items/show/119 check out this page, I believe there are a couple of pictures you may be very interested in. Great shot! I love this one. Interesting to see the “Jaffe” sign for the nursery, which appears to be out of business. The freight station was not long for this world when this photo was taken. Heck, the last train would ply these rails just a year later. I was nine years old, living in a suburb of Boston when this was taken. Wonderful photo!